My first marathon was a lonely, long journey because I missed having friends and family along to cheer me on. 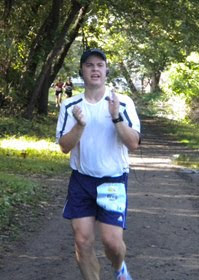 I talked about it in my post-race report, but the long and short of it is, I didn't see any real support after mile 10. It was just my dad there, so he couldn't get everywhere. And that made for a lonely run, especially during those late miles. But that completely changed in my last marathon. I specifically ran a race close to friends and family so that they could be there to cheer me on. The marathon web site had a great spot for spectators which gave them directions to all of the different exchanges. And while I only expected to see them at exchanges 2, 3, and 4, they ended up getting to all of them which was a HUGE pick-up for me. Just knowing that they were going to be at different points gave me huge inspiration to run strong. While not all race web sites are as good as the Lehigh Valley Marathon site, ask race directors or volunteers where the best places are to watch the race. And try to get to as many locations as you possibly can. The more the runners see you, the happier they are, and the more energy they'll have. It doesn't make for a very relaxing day for you, but at least on that day, it's all about the runners. I saw my mom at mile 22.6 and I had to hand her my running pouch and get a change of shirt/hat. But my dad had my shirt/hat, so I had to yell questions to her and find out where he was (about a mile further up). I probably wasn't the most pleasant at that point, but she didn't mind and she understood. And a mile later when I saw my dad, it was all business. I handed him my iPod, then threw off my shirt and hat and grabbed the other stuff from him. A brief exchange about my pace and then I told him I needed the purple gel thing and I was off. All business, but that's what you need sometimes. The exchanges aren't all going to be pleasant. Family/friends asked me what I wanted at the finish line. I had a huge craving for soft pretzels, so they brought that along, along with towels and my running bag. Just the simple act of bringing something that would taste good is very appreciated. When I finished, all I wanted to do was sit down. But, after my brain had played tricks on me after my first marathon, I wanted to make sure that I was doing OK mentally. As if it were on script, family/friends came over and congratulated me and then allowed me to stay quiet for a couple of minutes while I gathered my thoughts. And then we talked about the race, my pace, etc., just to make sure I was lucid. Very much appreciated. And they had the patience to listen to the story about how miles 20-26 were so tough, etc., after I had told the story several times. 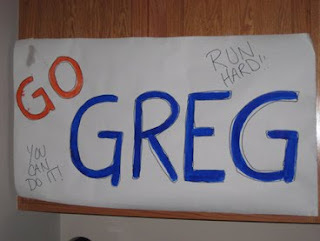 When I woke up the morning of my last marathon, my friends had made a sign and put it above the toaster. It felt amazing to see that, and when they brought it along for the race, it felt even better. If you can make signs, do it. We love seeing them and so very much appreciate the effort. Also, the funnier the better. The race bibs had our first names on them (great idea! ), so people could yell out encouragement for us. Coming through some tough miles and hearing people scream your name to encourage you is an amazing feeling. If you see a name, call the runner by their name. So that was a list of what I appreciate from spectators. But I think we also need to appreciate the spectators themselves. At every exchange, I made an effort to clap for the spectators and volunteers and thank them for their energy. These people are standing out in the cold for hours at a time to offer encouragement. The least we can do is applaud them for their effort. The picture is of me clapping for spectators. You have no idea how much that encouragement means to us! I am just happy to have them there, even if I don't know them. They make a big difference specially during the last miles, when we start to struggle. My son joined me last Marathon in mile 24 and ran w/me to the finish line. It was a wonderful feeling. Unforgettable, and priceless.